I began recording music when I was a kid but I first got into radio broadcasting when I was promoting Blues Fest. In 1991 I asked Laura Johnson, the KASU station manager, for help with the promotion and she suggested that I do a show that would air on Saturday night before Blues Fest. I already had many recordings of the performers. She assigned Rich Moellers, an experienced radio producer and a Radio/TV student to help me. This went well and she offered me a weekly show. I thought it over for about one day and decided to do it. Rich was the engineer and I was the host. Something Blue was on the air. My education was in music, math, and computer science. 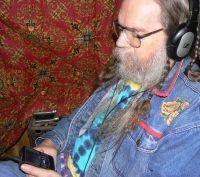 My career was in computers and I was an early adopter of digital audio technology. It wasn’t long before I was producing Something Blue at home and bringing CDs to the station. After doing the show for ten years I decided to take a break because of the time required to do the show, run my own business, and raise a family. After I retired I resumed my study in music. One day I stopped by the station for a visit and Mike Doyle, the current station manager, asked if I would be willing to do Something Blue again. I thought it over for about one day and I decided to go for it. I’d like to thank Mike Doyle and everyone at KASU, especially Marty Scarbrough and June Taylor for all their help and encouragement. I feel that all the shows produced locally by staff and volunteers make KASU a strong voice for arts and music in Northeast Arkansas and the Mississippi Delta. I especially want to thank all the listeners for appreciating the show.